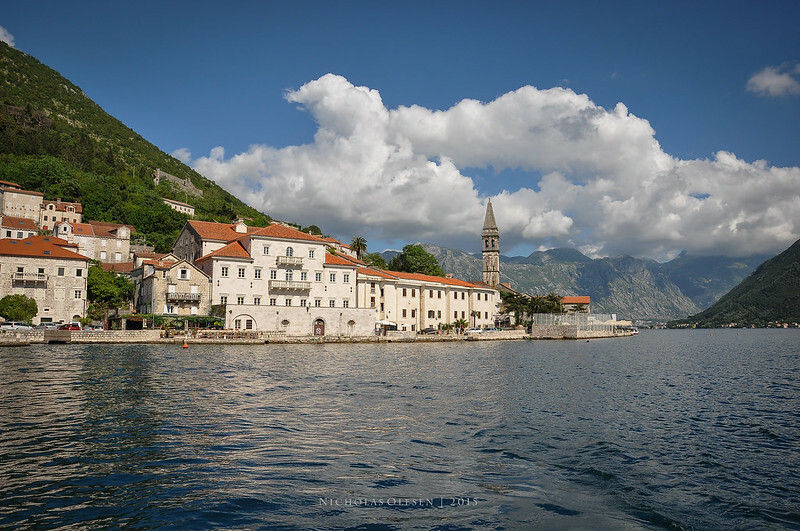 A view of the town of Perast on the Bay of Kotor in Montenegro. This was taken from a boat heading out to one of two man-made islands in the bay, called Our Lady of the Rocks. There is a small Roman Catholic church on the island which is open for visitors, but for me the highlight was the view back towards Perast. I was also very lucky with my timing – as I arrived a boat left the island with a big group of tourists, leaving just me and two other people on the island. 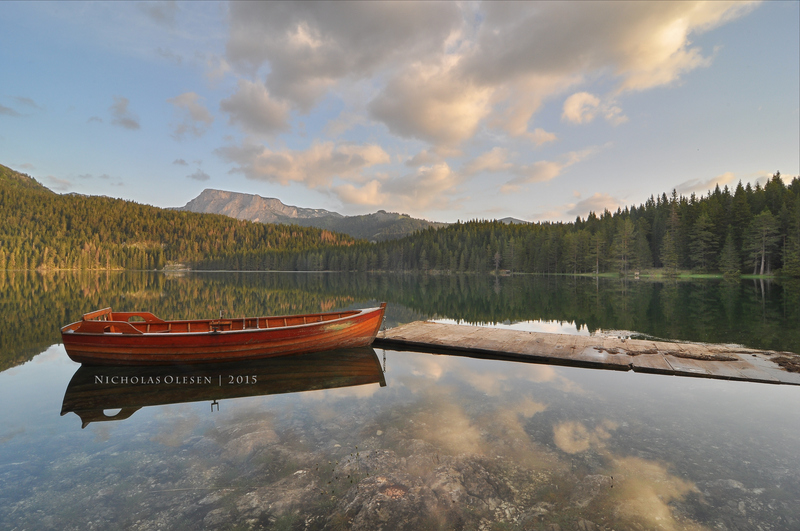 I’m not a morning person, but after all I’d heard about the Black Lake in Durmitor National Park, I decided it was time to make an exception and get up for sunrise – and I’m glad I did! I set my alarm for 5:30am, and arrived at the lake just before 6am. The lake was perfectly still and silent except for a few birds waking up. There were a few puffy clouds to catch the light, and the still water gave perfect reflections. After a few shots over half an hour I then went back to my hotel to sleep for an extra couple of hours, and when I woke up again it was cloudy and rained most of the rest of the day! The shot above is a composite of four exposures – one for the boat, one for the remaining foreground (water and trees), one for the mountains, and one for the sky. I merged them with GIMP and then made a few final adjustments in Lightroom. 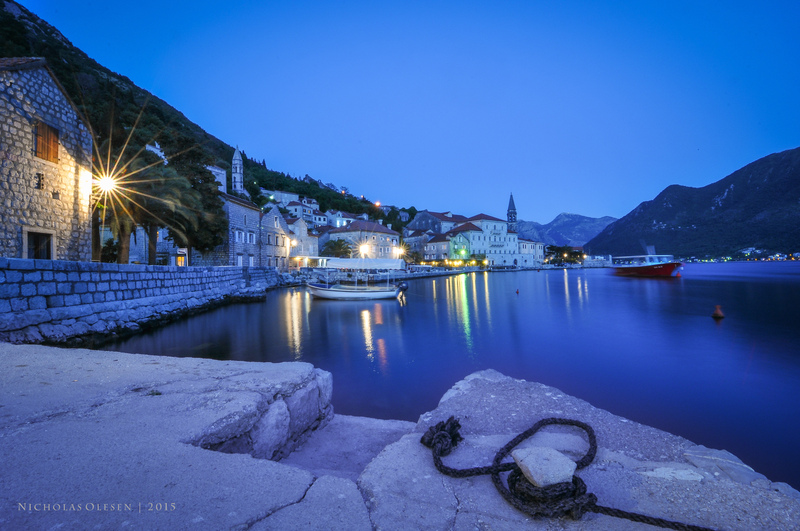 A view of the town of Perast in the evening during blue hour. I used a high f number for this shot, to get the “rays” of light from the lights in the town. The resulting extended exposure time also “flattens” the water and intensifies the blue color. 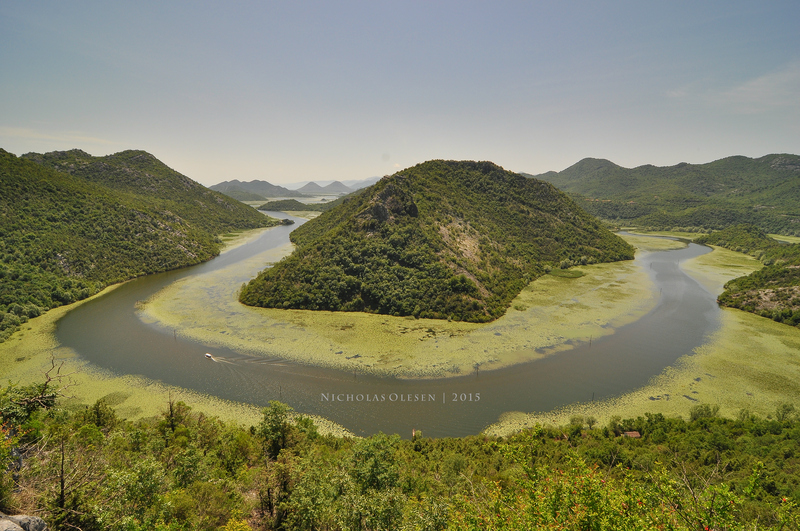 Lake Skadar National Park is in eastern Montenegro, on the border with Albania, and hosts a large array of bird life. This view is taken near the town of Rijeka Crnojevića, where a river flows into the lake. The town of Rijeka Crnojevića doesn’t have much of interest to be honest, although it used to be where Montenegrin royalty went in the winter to escape the cold weather in the capital, Cetinje. This view point is a few km outside of the town, along a twisty, narrow mountainous road which is itself off the Podgorica – Cetinje highway. Lovćen National Park sits high above the bay of Kotor; the road from Kotor up to the top is a narrow road with more than 25 hairpin turns – each one offering a more spectacular view than the one before. 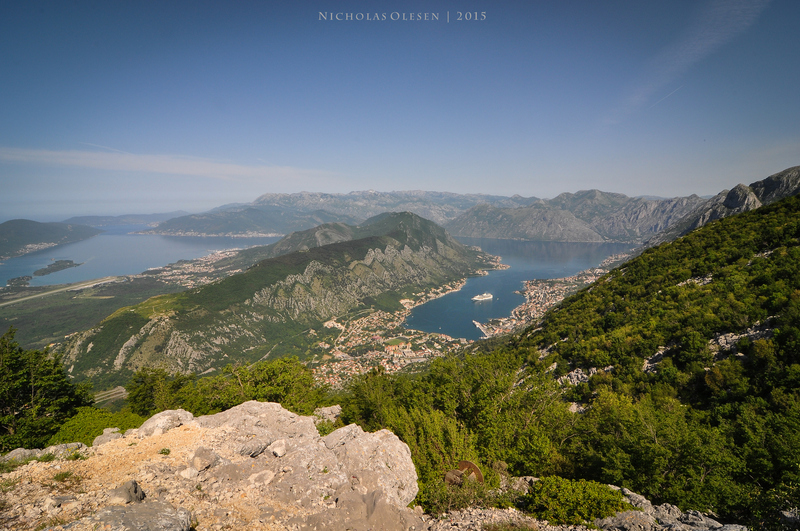 At the top, you can see across the fjord that forms the bay, with Kotor nestled under the trees at the end of the bay. Biogradska Gora National Park lies in central Montenegro. It’s known for its pristine ancient forest. Many trees are several hundred years old. The park also has several glacial lakes, including the main Biogradsko Lake at the entrance to the park. Unfortunately I only had a couple of hours in the park so could only walk around this lake. It had been raining most of the day, but cleared up a little as I arrived, which meant I nearly had the park to myself – only a handful of other cars were parked at the entrance. 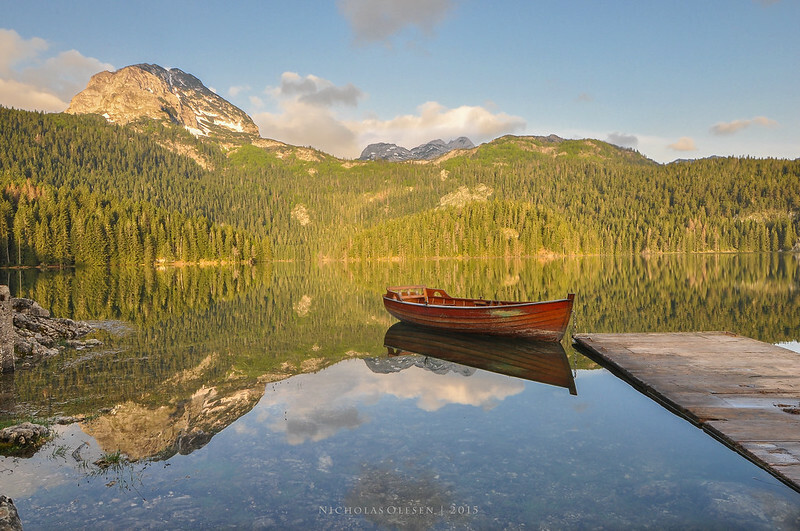 I’m not a morning person, but after all I’d heard about the Black Lake in Durmitor National Park, I decided it was time to make an exception and get up for sunrise – and I’m glad I did! I set my alarm for 5:30am, and arrived at the lake just before 6am. The lake was perfectly still and silent except for a few birds waking up. There were a few puffy clouds to catch the light, and the still water gave perfect reflections. After a few shots over half an hour I then went back to my hotel to sleep for an extra couple of hours, and when I woke up again it was cloudy and rained most of the rest of the day! 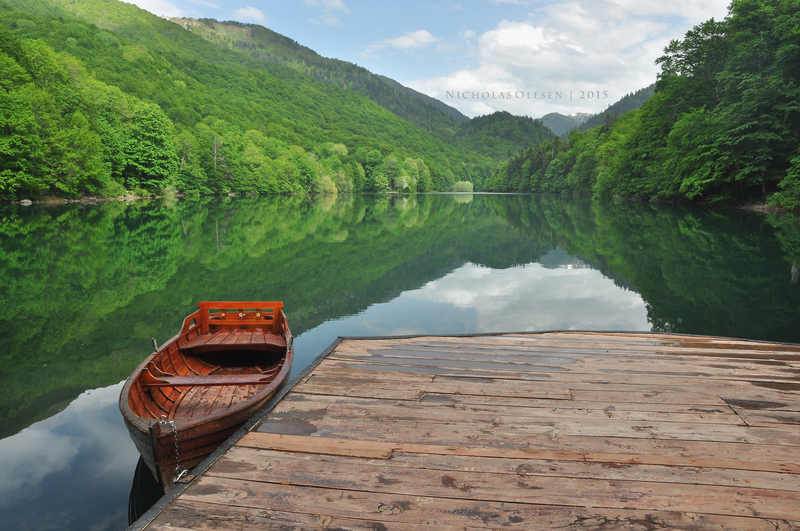 The shot above is a composite of three exposures – one for the foreground (boat, water, trees and mountains on the left), one for the sky, and one for the darker trees to the right. I merged them with GIMP and then made a few final adjustments in Lightroom.